This Saturday at 14 locations in the Lake County area our full time prescription drug take back network is partnering with the DEA to have a comprehensive take back day for your unwanted prescriptions, so from 10am to 2pm on the 26th you can drop off your excess prescriptions, no questions asked, at the departments listed in Quick Tip # 2’s link! Quick Tip #1: Find the box nearest to you by clicking this link. Quick Tip #2: Departments participating in the take back day are listed here. Prescription drugs that languish in home medicine cabinets are highly susceptible to diversion, misuse, and abuse, creating a public health crisis. The rate of prescription drug abuse in the U.S. today is at an alarmingly high level—two-and-a-half times more people currently abuse prescription drugs than the number of those using cocaine, heroin, hallucinogens, and inhalants combined, according to the recently released 2010 National Survey on Drug Use and Health (NSDUH). The same study shows that a majority of abused prescription drugs are obtained from family and friends, including from the home medicine cabinet. 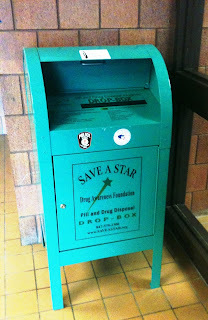 The Lake County Drug Free Communities program has the following sites available for drug drop-off. We are also working with Lake County area municipalities and townships to get more sites up and running as well.